Lou Schiela: Why am I knitting this? Why am I knitting this? My wrap is moving along. Slowly. I'm having fun knitting this. The yarn is really soft and silky. I love touching it. 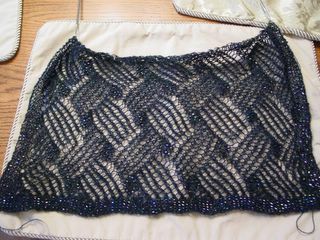 I have to stop every two or three rows to slide the beads down and I just had to break the yarn to string more beads but this is a great knit! I can't wait to block it. This baby is going to be big. And soft. 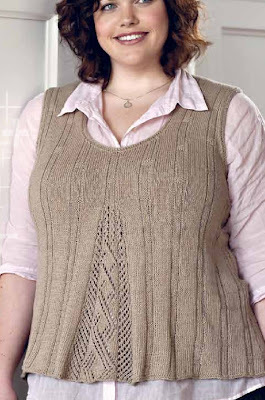 I've been asking my self why I'm knitting this. I don't need a wrap. I get dressed up approximately once every never. Why am I knitting this wrap? Because the stars aligned and everything fell into place and I couldn't NOT knit this wrap. But the fates conspired and this wrap was conceived. Knitpicks developed their own line of yarns which included this lovely Alpaca Cloud. They also priced their yarns such that it was impossible for me not to buy some just to check it out. I had no idea what I was going to knit with it but I wanted to see and feel it so I bought two skeins in each of two colors. I started blogging and stumbled accross Gromit Knits. 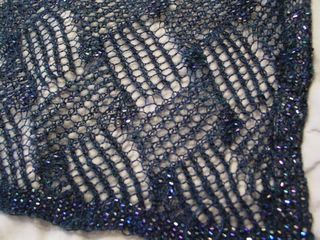 Anmiryam knit a beautiful, rectangular, beaded, lace wrap. I was smitten. I kept going back to her blog to look at the pictures. Slowly, the idea was coming into focus in my mind's eye. I fiddled with some lace patterns. Charted out something I thought would look nice, bought some beads and cast on. I've been working on it ever since. I'm addicted to knitting this wrap. It's the first project that I've worked on since I started blogging that will keep me from my blog. I was troubled by the ultimate fate of this wrap though. Although I am having tons of fun knitting it, it's really not my style to wear. I really couldn't think of anyone that would enjoy receiving it as a gift. DH stepped in to save the day. I have a certain milestone coming up. For my birthday DH is planning an evening out in Philly which will give me an opportunity to wear my fancy wrap! Now I just have to make sure it's finished by the end of May. 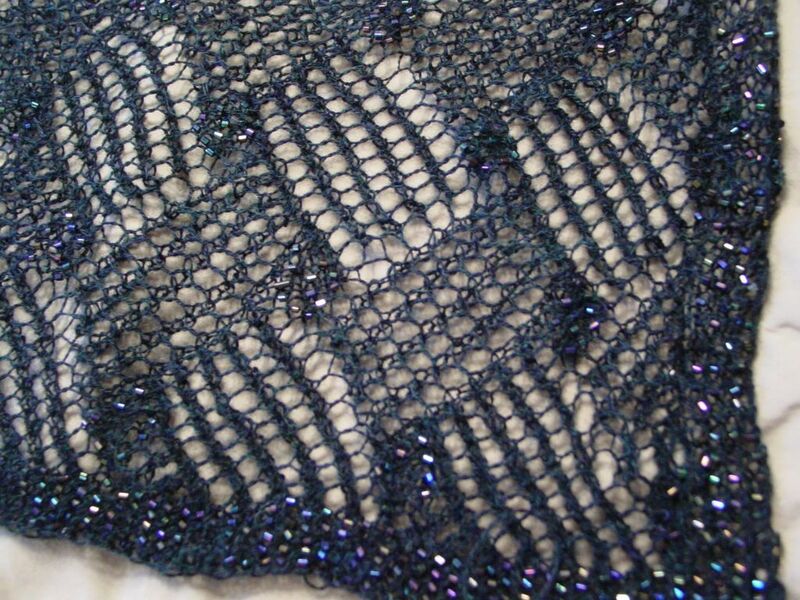 I have been having thoughts of another lace project. While I'm knitting this blue alpaca wrap I've been fantasizing about a lace cable knit with the other color I purchased (Autumn). I was in danger of drifting away from my current project as the Autumn tones sang their siren's song. A definite deadline will help keep me focused and keep my wanderlust at bay! Your wrap is absolutely gorgeous! Wow, I'm in awe! Can you post some more details? In particular, what size needles did you use with that Alpaca Cloud to achieve such nice texture? 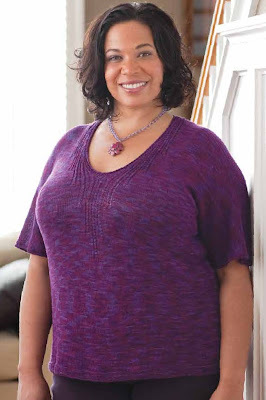 Is your pattern inspired by something in one of Barbara Walker's Treasuries? How did you decide where to put the beads - are they just along the edges? Your wrap is beautiful. You're making me think about doing something like this----however, I've never knitted something so intricate nor have I knitted with beads before. Can you bring it to our knitting group on Tuesday? This is such a beautiful wrap. 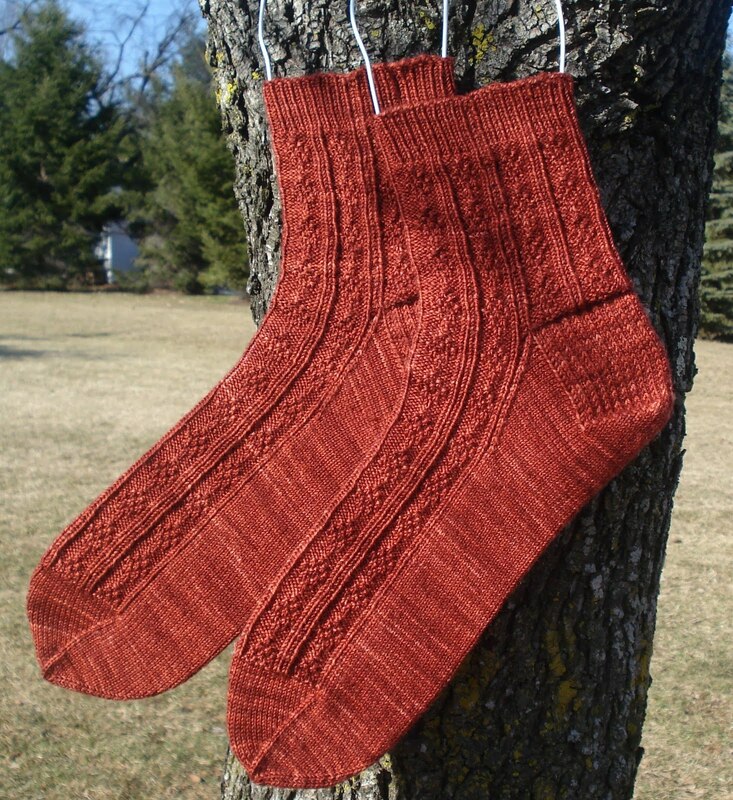 Thanks for posting the stitch pattern. I would like to do it in some rayon thread that I have. Hope you finish it in time for your special day. I'm sure you'll look gorgeous with it. 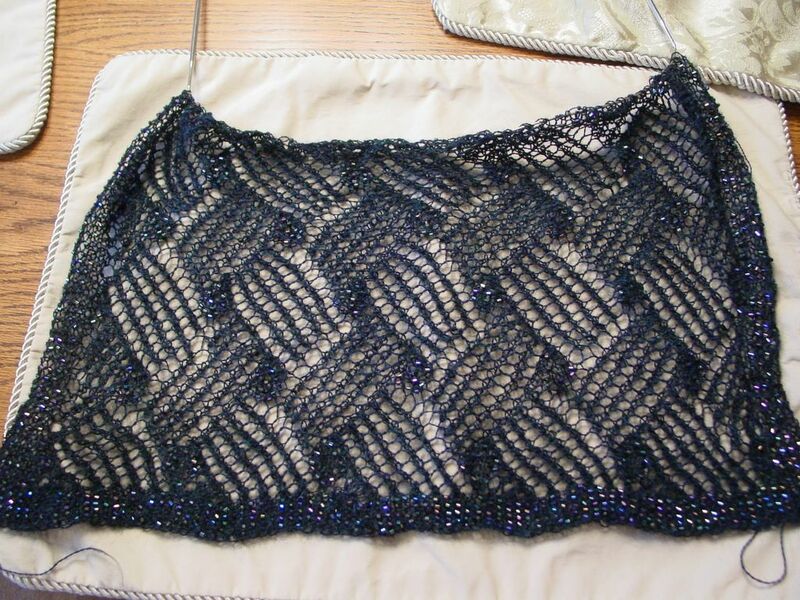 The more you knit of this, the more spectacular it is. I can see why you were so taken by it. Even better that you have a special event to look forward to! I may have to knit with some more beads again sooner than I thought.